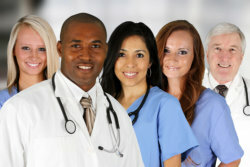 4 Tees Healthcare Training School is a locally-owned and privately managed healthcare training provider for nursing, phlebotomy and home health aide hopefuls in the East Orange, New Jersey community. Today, there are many health care providers and medical institutions who have to cope with the unendingly rising demand for continuous healthcare services. Staff shortage often interrupts the delivery of health care, which can be very detrimental to the health of patients and impede the practice of many professionals in the industry. We all know how demanding the healthcare profession can be so we recognize our role in consistently supplying healthcare providers with qualified staff. Through the training programs we offer, we believe that we can contribute to the community’s eternal need for qualified nurses, home health aides, phlebotomy technicians and allied medical staff. Students who complete our courses move on to join these healthcare organizations – and you can be one of them! If you wish to enroll at 4 Tees Healthcare Training School, then please submit your information here. If you are a medical facility or health care provider who would like to partner with us for human resource and staffing, please send us a message here.